When karma is completed our awareness is free to explore different dimensions and aspects of our being, the journey of contemplation and self observation begins as our disturbances are eased; we become calm, centered and empowered to look into our own nature. If the Karmic dross is not completed, there is no space to allow fresh insights, greater understanding and higher emotions to emerge, in absence of which we fail to realize our true nature despite our yearning and efforts. Completing Karma is the ultimate healing one can receive. Many therapies and healing modalities are effective giving us relief and healing from disease, however if our conditioned mind is not healed, the root cause lies intact awaiting the next opportunity to strike back. Completing our Karma clears the very root cause of our disease and thus allows for a true healing to take place. The ego’s belief in a separate, smaller, and non-deserving self, blinds us to the infinite source of love and power that we are. Completing the Karma behind this conditioning can free us to embrace our true power and potential. Empowered with this sense of spaciousness, we can embark fearlessly on the adventures of life. Ego has a fearful clinging and resistance to security, which does not allow real abundance to manifest and keeps one moaning in the victimhood of never ending insecurity and scarcity. Unable to perceive abundance, you slip into sadness and guilt, feeling that the apparent lack is destined forever. When this is completed, a natural sense of security is felt and abundance manifests on its own accord. It is our relationship with our own self that determines our relationship with the outer world. Our parents, siblings, spouses, friends and colleagues merely reflect our own identification with that role. Realizing this, we can always see what aspects of our self are not integrated into our awareness by taking a look at dark spots in our relationships. Any relationship discord that we face is nothing but a faulty projection coming from our stored memories from the past and the consequent beliefs we have cultivated about it. When you complete the charge of your memories and wrong beliefs about your relationship with your own self and with others, you experience freedom to relate with real presence and awareness, without fear or ignorance. Sexuality shapes our core beliefs about our own self, Body is our first point of identification and it determines how we feel about ourselves throughout life. Any imbalance in our sexuality can affect our health, abundance, security, creativity, self-expression and emotional well-being. Sexuality also plays an important role in our intimate relationships and if it is not well balanced it can block our way to fully experiencing and enjoying intimacy. Our past traumas, guilt, negative conditioning and disgust towards sexuality need to be released in order to experience holistic presence with our sexual nature and once again feel wholesome with our body. Moreover our body needs to be in balance if we ever want to transcend our identification with it, because while it remains imbalanced, not in harmony with our true nature, it will keep our awareness locked away in its skewed matrix. So to fulfill our evolutionary journey, we need to bring our sexuality to a state of equilibrium. Karma Completion offers you the guidance to do this; it facilitates this process of releasing your entire disempowering program about sexuality and allows you to become free to experience true joy of intimacy. Karma is not a record of deeds kept somewhere in a distant dimension, it is at the heart of all our memories stored in the meridians of the body (not just the brain). These memories or stored information are based on past experience and filter our perception of reality. They also influence the development of a large part of our genetic makeup. We not only pass on our biological features to our children, we also pass on all of our karmic traits as well. Our fears, phobias, beliefs, negative and positive tendencies, our strengths and weakness, our yearnings, our entire knowledge and ignorance, everything is transported to the genes of our children. If you are aware of this, you would obviously choose to pass on the empowering karma or positive information in your genes. And to do this you need to complete your own unconscious patterns and reprogram your cells with empowering beliefs. Doing this safeguards your progeny and provides them with free space to create their own life experience with minimal prerecorded programming. This can also save them from hereditary disorders, from negative traits running in the family; it can also enable them to attract more positive people and circumstances and also save them from many fears or phobias which can otherwise hamper their growth and well being. Our ego mind is like a computer, storing information and constantly running programs to help us proceed as unscathed as possible through our life experience. In the same way a computer with no free memory becomes slow and cannot do its work properly, cannot engage with a new program, our mind when full of past memories cannot find any free space to perceive new ideas or circumstances correctly and thus clouded, we cannot integrate present experience into our awareness. We keep going on in an automatic response mode and lose our awareness of the present moment. It is also not so much that the actual memories cause the problem, rather the energy that the memories carry in the form of a negative emotional charge caused by either clinging or resistance to life’s circumstances. Thus, it is not that we need to forget our past or erase all memories of our experience to create a clean slate, rather it is that we need to release the blocked energy within these memories. When our mind is free from this mental and physical junk pile, we naturally think in a more progressive and spontaneous manner. Freedom from problems is not the key; freedom from conditioned mind is what we truly need, because it is the mind that interprets discomfort as a challenge. Only a mind that is not conditioned, can cultivate and sustain the view of absolute truth; to come from the unbridled awareness that we are in essence, while simultaneously moving through the re-written role of the dream character in our play. Keeping this perspective of the awareness that we are, rather than being lead 24/7 by the unconscious ego, allows us to overcome the challenges of the relative world. 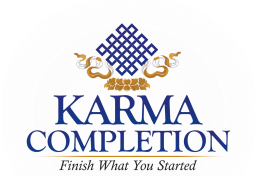 And the Karma Completion program provides you with a simple and effective way to integrate the absolute view, while slowly gaining a more steady awareness of a non-dual perspective, and thus cultivating a state of equanimity. Freedom is the sky in which we can fly for eternity and feel our aliveness, not in the limited sense of the relative world, but in the ever expanding awareness of our true nature. Safeguard your progeny from your own negative patterns. Discover the joy of s​pontaneity versus automatic compulsive behavior. Cease suffering over your own suffering. Sail through your negative karma without attachment. Stop repeating the same negative situations. Make Peace with what cannot be changed. Make progress with what can be changed. Experience True Contentment & Feel Complete With Yourself. Transform Your Life Into A Source Of Joy For Yourself and Others. Saturate Your Life With Bliss and the Clarity of Awareness. Freedom From the push and pull of desire and resistance. Be IN the World But Not OF It.